Tilly and the Buttons: Your Makes! 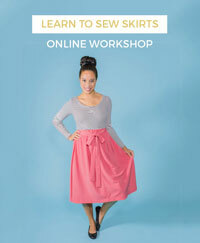 It's time again to be dazzled by all of the gorgeous makes from the lovely sewing community. 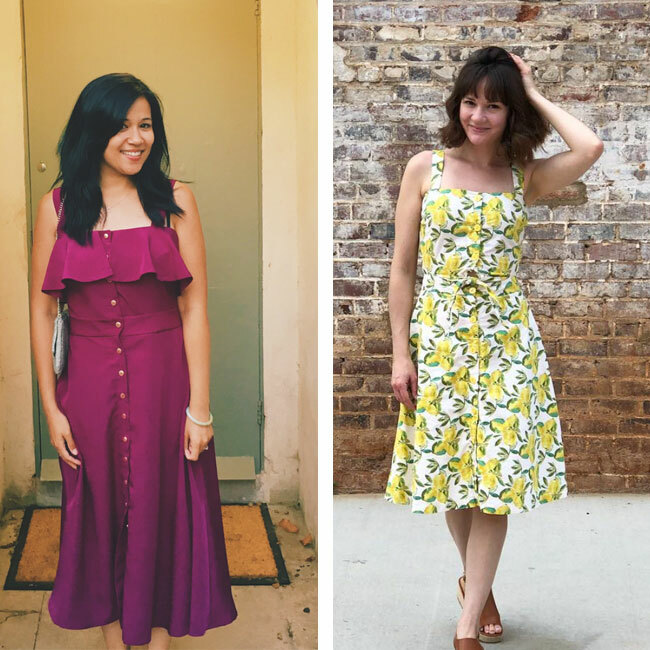 It's Jenny here, as summer is drawing to a close I thought I’d round up all of the fabulous inspirational sewing you have been up to. Lilac has been a very popular colour in our office lately and this Joni dress by Carrie is fulfilling all of our lilac-y dreams. We’re loving the watermelon print Carmen has used for her Joni, it’s perfect for summer. Find Joni in our book Stretch! Stevie has been the dream outfit for summer, its boxy shape means you can feel breezy and cool whilst still looking effortlessly chic. Holly’s hibiscus print Stevie dress is eye-catching and gorgeous! 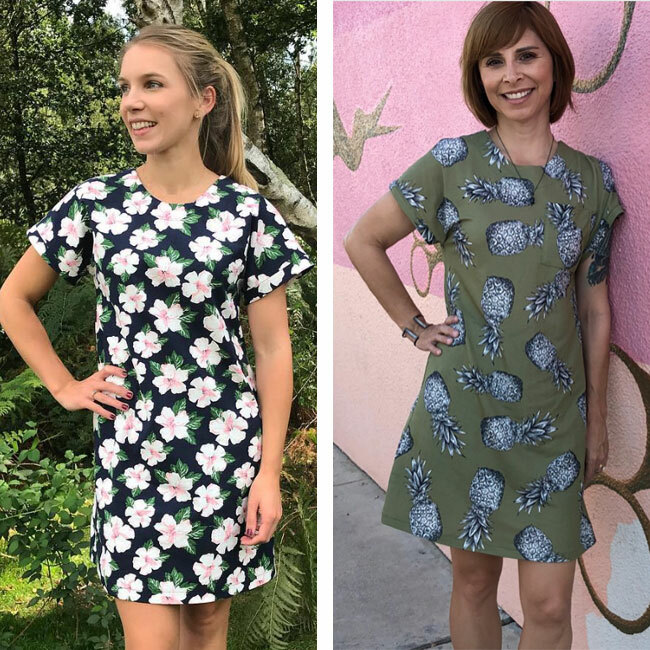 The beautiful pineapple print on green background that Bonnie has used for her Stevie dress will be perfect for transitioning to autumn months and layering. As we’re coming into September there’s the back to school/work feeling in the air. 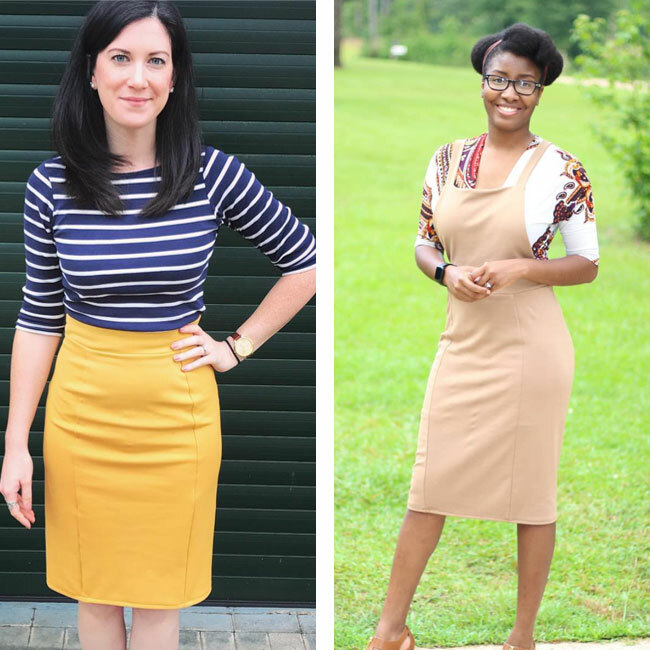 The Bibi pattern is ideal for office-wear as you can look professional but secretly be super comfortable. StrictStichery’s Bibi pinafore looks elegant and the neutral colour will be so wearable. Rebecca’s bold yellow Bibi skirt paired with the stripy top takes Bibi from smart to casual and still looks glamorous. Find Bibi in our book Stretch! September is still kindly giving us some warm spells and the Seren dress inspiriation is still in full swing. Meredith’s Lemon Seren dress with the tie waist is the summer dress of dreams. Choo’s beautiful magenta Seren dress with the flounce is making us want to swoosh around in the summer sun and drink cocktails at the beach bar. 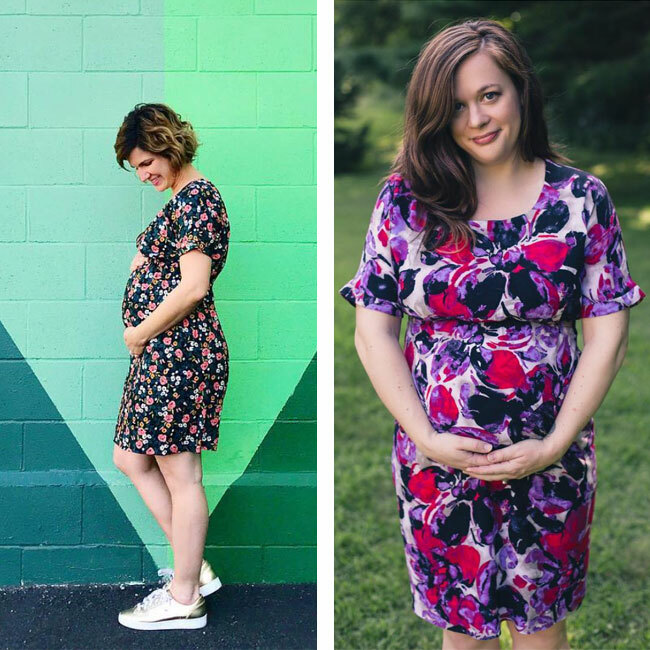 Did you know we also do maternity PDF patterns? 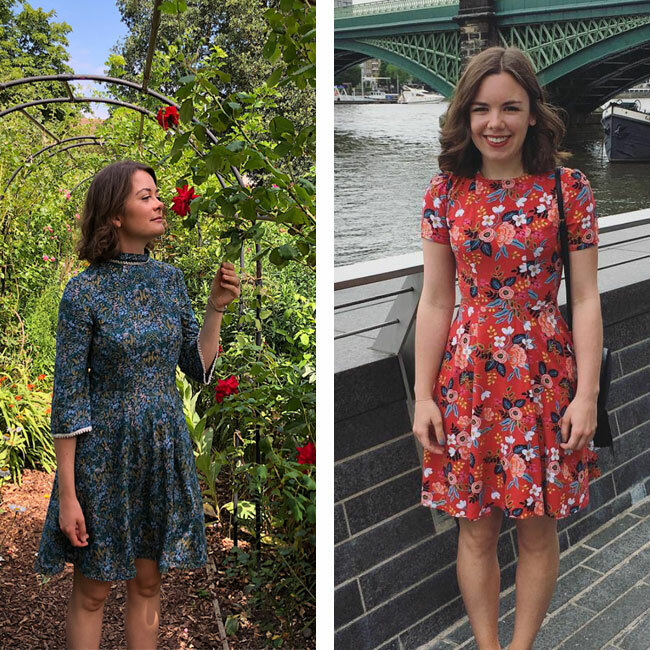 Sarah’s gorgeous floral rayon Mama Bettine dress looks ideal for the warm weather we’ve been having. Crystal’s Mama Bettine dress in this stunning bold floral print looks beautiful and comfortable. Cleo is a great seasonal transitional piece of clothing, it can be layered with tights and a (rainbow!) jumper like Hannah here who is dressing for the Scottish summer. 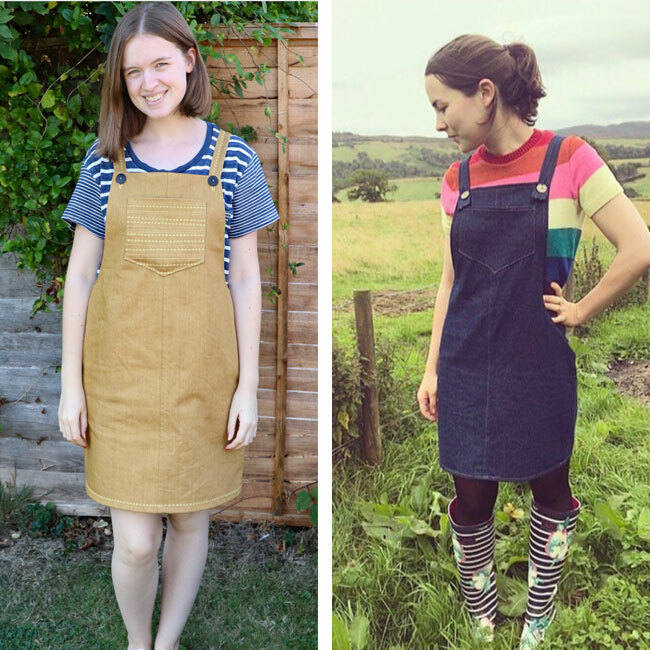 Cleo is a really easy make and looks great with added details like Megan’s machine embroidery on her mustard Cleo. 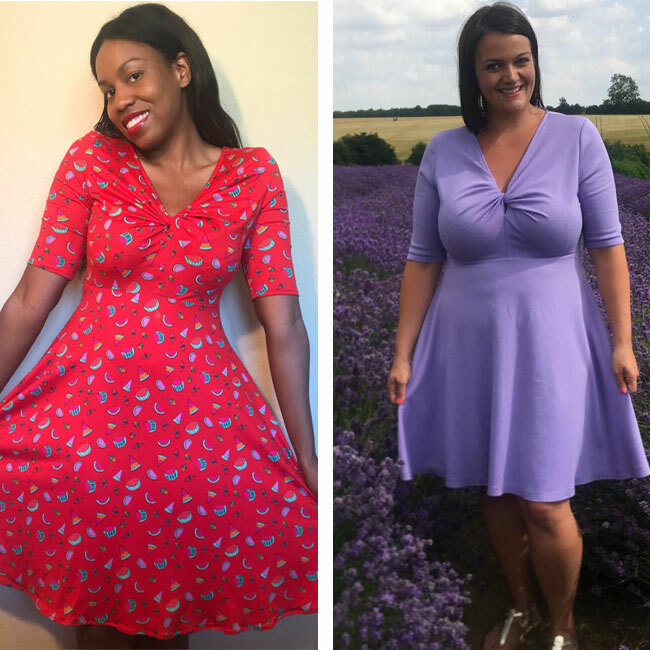 Martha is a flattering flowy dress that can work all year round, layered with tights or floating around in the summer gardens like Jules, the bell sleeve and mandarin collar trims really tie this outfit together. Kate Eva’s bold floral print Martha is looking dazzling against the London background. We loved seeing Ellie’s stripy Coco at the beach! 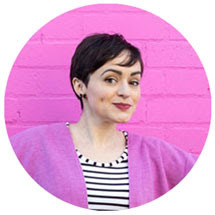 And the colder weather that’s coming has got us thinking about cosy Cocos like Laura’s with contrasting pink yoke and cat fabric, so dreamy. The Rosa shirt dress is ideal for colder months as it can be made in corduroy like Joy’s vibrant red Rosa. Emma’s denim Rosa with multicoloured snaps adds a lovely pop of colour. 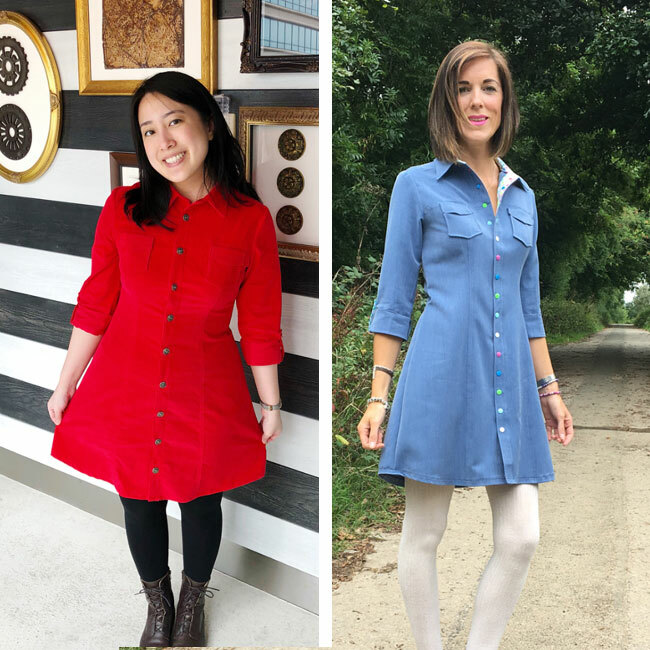 The Rosa shirt dress pattern is my favourite, I love the flattering shape of the gently curved princess seams! We love seeing everything you make! 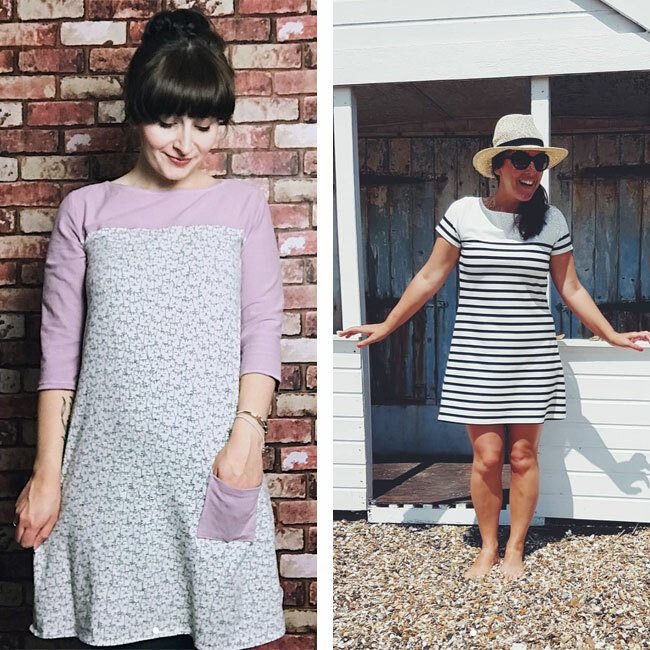 You can keep an eye out for other amazing makes on our Maker Gallery and tag us using the hashtags #SewingRosa for example so we can see them on Instagram.